Questions for the genetics of India podcast…. Zach, Omar, and myself will do a podcast on Indian genetics next week. I already did one on this topic for my main podcast, so I’m curious what readers of this weblog want to hear about. We can’t guarantee we’ll use the questions, but it’s possible. I think the format will mostly involve Zach and Omar leading the conversation and I’ll try to talk as fast and concisely as possible. Also, we got our first review on iTunes. Would still like to get some on Stitcher. And in case people want to hear more from me, I was a guest on the Two for Tea podcast. My episode should drop in the next day or so. Last night V & I hosted Pakistani potluck. It turned out to be a rather intimate affair with a few Pakistani friends of ours. After the last few weeks of intense Indian & Kashmiri events I thought it would be nice to have a light-hearted evening of biryani, nihari and haleem especially before we go meat-free at home. As an aside I’ve begun to believe that the meat consumption we are having is simply far in excess of our hunter-gatherer ancestors. Industrial farming is a blight and my hack is simply to eat meat outside of the home. White people will still define the non-white age.. (1.) The (part) Chinese American missionary, John Allen Chau, who is technically a PoC. (2.) The Sentinelese themselves who are the pristine natives. (3.) The Indian government, which is not Western. Essentially in a rather amusing way it involves the three great non-white colours of mankind (black, brown and yellow). Also to make the matter even more tantalising when we think “remote Indian tribes” we don’t usually think of India but rather Native American or Amerindian peoples. So the story involves Christianity, missionaries, colonialism and native people trying to fight back; a real life Desi version of Avatar. Could have been written without the gratuitous colour commentary surely? Mr. Pandit, the pale-skinned son of a Kashmiri professor, reaches to pass a coconut to a group of naked, dark-skinned young men who have waded waist-deep in water to greet him. He sits companionably beside a dark-skinned young woman, whose hand rests casually on his thigh. Film shot in 1974 shows him — a reserved Brahmin — dancing exuberantly with a bare-breasted Jarawa woman. The Shanghai event was supposed to be the biggest fashion show in Dolce & Gabbana’s 33 year history. It’s using “woke SJWism” to punish Dolce & Gabana. Shanghai was meant to be their biggest fashion show in 35 years. I don’t know what to make of the article below. The Abrahamicisation of Hinduism is one thing but is it worth projecting those values? I know that copulating deities are on temple walls so I’m just asking how do Hindu deities need to be treated. A funny story last night; V asked me if I knew what the Shiva Lingam was. Apparently she had just found out what it actually was since she had been told throughout Hindu school that it was one of Shiva “limbs.” The Victorian legacy in India is fascinating to observe. I showed up at the Institute of Peace and Secular Studies (IPSS) a few days after the rally. The person who had called the meeting was running late so I just loitered around. It was a two-room apartment that had been modified into a makeshift office space with some spare area for sitting, with floor cushions etc. There was a book rack full of books in one corner. The lady who managed the place was present there and said Hello. A few minutes after I had arrived, two boys a few years younger than me showed up as well. We started chit-chatting and it turned out that one of them was a student at LUMS and the other went to another private school. We were talking about democracy when they revealed that they were not in favor of democracy at all and then spent the next hour arguing why they thought so. They were under the influence of Hizb-ut-Tehrir, an Islamist organization that wanted to establish a caliphate. I tried to argue with them using rationality and logic but they were not willing to listen to a counter-argument and eventually stormed off. I discovered that IPSS was offering a short course in Political Economy and History and all I had to pay for was a copy of their syllabus. 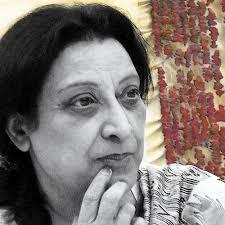 The poet and scholar Fahmida Riaz passed away today. 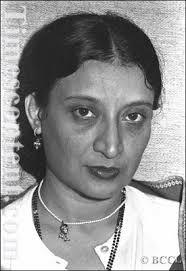 She was known for her fearlessness and her willingness to call a spade a spade and she suffered for it (including an Indian exile during the Zia regime). First unique marriage of its kind in Pakistan a man got married with transgender in Karachi. That's very good initiative in this way we can give equal rights to transgender community and hopefully he will treat him well. Hope no Molvi will put fatwa. I’ve been pretty upset with Pakistan because of Asia Bibi however this important news gives me hope for the Homeland. 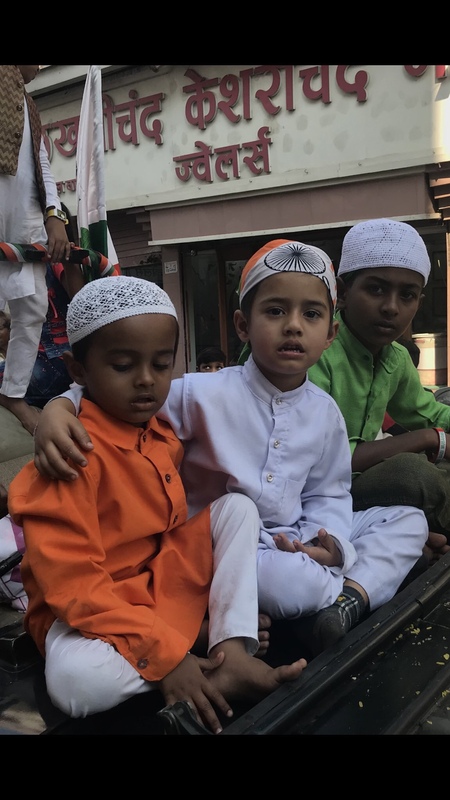 The picture below (stolen off Omar’s feed) gives me hope about India’s Muslims. These symbols are important since they signal society’s direction. I will be honest I feel Indians & Hindus are forced to be far more liberal and enlightened than what their current Socio-economic level whereas Pakistanis are similarly forced to be much more conservative given their basic Indic Cultural orientation. Both will have much to learn and give one another if ever see an Anchsluss (since our Brave Pandit has started using Nazi analogies). In the podcast Razib touched on Indian-American SJWs who he found offensive (I hope I’m not mixing or misquoting him). I am just shocked by the above tweet! I am pro-Dalit and I stand with them. However India must not be humiliated by the West and follow China’s example. The future doesn’t look good for India’s upper castes; they’ve migrated, intermarried or are barren. The irony is that only the Parsis are allowed to “complain” or do something about their demographic survival. But the same thing that’s happening to the Parsis is also happening to Kashmiri Pandits (my Pandit friend is one of 6 cousins who are in their 30/40’s and have two children between them), Sindhis and I’m sure other castes. Yes there is something called noblesse oblige and the Indian elite have spectacularly failed in discharging it. However the new “check your privilege” is a hideous mutation of this ancient and aristocratic concept much as the current Lefty moral paranoia is simply neo-Puritanism. As I said in the podcast Islam, Pakistan and Muslims attending not threats to India in a substantive manner. The India media has frothed over the mouth over the wrong enemy but the Hindu progressives have allied with colonial powers since the first British Invasion. Yes caste, Sati and untouchability are all wrong but Hinduism would and could have corrected on it in its own right. Islam does many things badly but Muslims are embarking on an internal reformation. It may not work out but it’s worth a try. An even better example are the Chinese; they’ve collectively fingered the world not only with prosperity but cohesiveness. Pakistan is now a satrapy of China at bargain bucket prices (Pakistan has clamped down on any meaningful debate on CPEC while staying Mum on the burning Uighur question). India has to maintain her cohesiveness and I fear the external interference of Caste Wars will bring about another 2/3 centuries of ignominy. Power never relinquishes itself peacefully; we only became free because Britain & the West exhausted itself and its moral credibility in WW2 (the Elder Gods plunges themselves into Raganorak). Why is India allowing foreign missionaries?